Retired Professor of English, Southeast C.C. Two grown children, two grandchildren. I retired in May 2014 after 37 years of teaching, 10 years at JHS and 27 years at Southeast Community College. I left JHS in 1987 and was hired for "startup" person for Southeast's program in Letcher County. I was transferred to Middlesboro in 1994 just in time for the opening of the new campus there. I was divorced in 2000. I learned to speak Spanish and have taught English in Costa Rica and loved it. I also taught English in China in 2012, and I've taught college courses in prison twice. I am active in community organizations: Middlesboro Little Theatre, Discover Downtown Middlesboro, and St. Mary's Episcopal Church. Fall of 2014 I came out of retirement part-time to teach some classes for LMU in Harrogate, TN. Currently I am working with at-risk 2nd, 3rd, & 4th graders at Middlesboro Elementary on math skills. I taught at JHS for 10 years. I have so many fond memories of the people from Jenkins, and several of them ended up working at Southeast. I had Jason Helton (JHS class of '87) in ENG 102. What a blast from the past! He's one of many JHS students I ended up teaching at Southeast in later years. And of course, I still hear from Gary Warrix and from Ina Kay Donaldson. Robert Cox has a birthday today. Robert Cox updated profile. View. Robert Cox added a photo to profile gallery. With my daughter Teresa on her graduation day from WKU, May 14, 2011. She completed her master's degree in Spanish at the University of Louisville in 2013 and works for the State of Missouri in its migrant student services. Robert Cox posted a message. New comment added. Joe Flint, good to hear from you! Robert Cox has left an In Memory comment for David H. Banks Principal. Mr. Banks was my mother-in-law's first cousin. He was very kind to me when I came to Jenkins as a first-year teacher. His wife Juanita and I worked on our master's degrees together. I am sorry for his loss. Robert Cox has left an In Memory comment for Robin Jabroski Hayes. Robert Cox posted a message. Let's see some grandkid pix, Gary!! Robert Cox added a comment on Profile. New comment added. Yes that is me! Up to something mischievious no doubt. Robert Cox changed profile picture. New comment added. 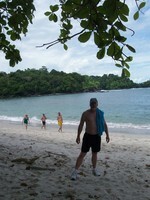 I am at Quepos, Costa Rica, on the Pacific Coast, in 2008. I am seriously considering retirement where the weather is always warm, Spanish is always spoken, and the beer is always cold. My old house, built 1934. I've lived here since 2000. Not fancy but comfortable for me and the cat. Visiting with my colleague Ina Kay Donaldson in Alabama, October 2010. Her daughter Doralee is a vet in Alabama Ina Kay has been living down there since she retired from JHS in the late 1990s. Southeast Community College celebrated its 50th Anniversary of service to the Appalachian Region this semester (Dec 2010). I am relaxing at Cozumel, Mexico, on Spring Break 2011. I was in China for a month touring and teaching English, Summer 2012.